A few months ago, I described how to use a Raspberry Pi to setup a domestic server. In this post we’ll see how to take snapshots using the Pi and a camera, so combining it with the server, we can create a simple monitoring system accessible from a phone. First thing we have to do is to run another server, separate from nginx to handle the requests. nginx is a very basic server that can’t do much else, but it’s capable of forwarding requests/responses. I got the Raspberry PI 5MP Camera Board Module to take the still photos. It’s an official product from Raspberry pi, so it comes with some nice integrations. In particular, I was interested in the raspistill utility. It has a few parameters and image transformation options, and we can specify an output file to which an image will be saved in JPEG format. The basic idea of this system is that whenever we hit our webpage, it will take a snapshot using the camera and display the image. Because it takes some time for a photo to be taken, we do it asynchronously. In the meantime it shows the latest snapshot it had on file. This simple project was inspired by a friend, who used a Raspberry Pi + camera to monitor his apartment during his vacation. I copied the idea with the intention to learn about the process and put the Pi I bought a couple of years back to use. I haven’t actively used this system, but it was fun to work on it and I’m now looking forward on working on other “home” projects. Execution of a Job can be initiated only when there is no running execution context and the execution context stack is empty. A PendingJob is a request for the future execution of a Job. A PendingJob is an internal Record whose fields are specified in Table 25. Once execution of a Job is initiated, the Job always executes to completion. No other Job may be initiated until the currently running Job completes. However, the currently running Job or external events may cause the enqueuing of additional PendingJobs that may be initiated sometime after completion of the currently running Job. MDN’s Concurrency model and Event Loop  describes this spec in a more friendly way. As in other programming environments such as C and Java, we have two types of memory available: the heap and the stack. The heap is the general purpose memory and the stack is where we keep track of scopes for example when doing function calls. The recursive calls should all go to the same stack, so they will be executed to completion, that is until the stack is empty. The calls provided to setTimeout() will get enqueued and be executed only after the value of the factorial gets printed. We discussed Web Workers in a previous post, in which we mentioned that it’s a separate thread that shares no memory with the main thread. In fact, according to , it has its own stack, heap and queue. It doesn’t violate the execution model of the main thread because communications must be done via a publisher/subscriber API, which means communicating between two threads is subject to the queueing. In this case, we always insert the property x and then y. V8 starts with an empty class C0 when the object is first created. When x is assigned, it creates another class C1 with property x and that points to C0. When y is assigned, it creates yet another class C2 with property y that point to C1. When the Point constructor is finished, it will be an instance of C2. It has to instantiate 3 objects one from C0, then C1, then C2. Accessing property y is an adding an offset operation, while accessing property x is two offset operations, but still fast than a table lookup. Other instances of Point will share the same class C2. If for some reason we have a point with only x set, then it will be an instance of class C1. This sharing of structures resembles the persistent data structures that we studied previously. Another interesting property of this method is that it doesn’t need to know in advance whether the code has indeed a pattern in mutating objects. It’s sort of a JIT compilation. We wrote about V8’s memory management in a previous post. 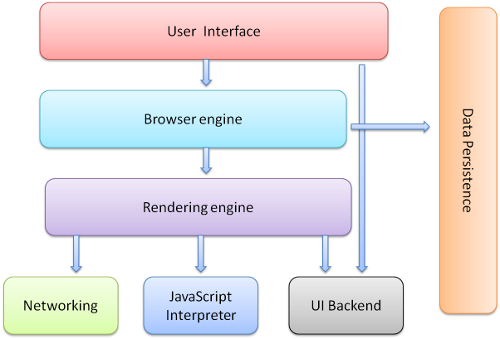 In this post, I’d like to share some notes from articles about how modern browser works, in particular the rendering process. All the aforementioned articles are based on open source browser code, mainly Firefox and Chrome. Chrome uses a render engine called Blink, which is a fork to Webkit used by other browsers like Safari. It seems to be the one with more documentation, so we’ll focus on this particular engine. The main sources are [1, 2 and 3]. They cover this subject in much more depth, so I recommend the read for those interested in more details. and we’ll use these steps as our sections to come. This step consists in converting a markup language in text format into a DOM tree. An interesting observation is that HTML is not a Context Free Grammar because of its forgiving nature, meaning that parsers should accept mal-formed HTML as valid. The DOM tree is a tree containing DOM (Document Object Model) elements. Each element corresponds to a tag from the HTML markup. CSS is a Context-free Grammar, so Webkit is able to rely on tools like Flex (lexical analysis generator) and Bison (parser generator) to parse the CSS file. The engine uses hashmaps to store the rules, so it can perform quick lookups. In practice, according to Garsiel , browsers will do speculative parsing, trying to download script files in parallel to the main HTML parsing. This process does not start though until all stylesheet files are processed. While constructing the DOM tree, the browser also builds another tree called render tree. Each node in this tree, called render object, represents a rectangular area on the screen. There’s not necessarily a 1:1 correspondence between DOM nodes and render nodes. For example a select tag has multiple render nodes, whereas hidden DOM elements (with the CSS property display set to none) do not have a corresponding render node. Since each node represents a rectangle, it needs to know its offset (top, left) and dimensions (height, width). These values depend on several factors, including the CSS properties like display, position, margin and padding and also the order in which they appear in the HTML document. The process of filling out these parameters is called the layout or reflow. In the next section we’ll describe this process in more details. * To compute the height, it first has to analyse the height of its children, and it will have the height necessary to enclose them, or whatever value is specified in the CSS. The green box (A) will have the height enough to contain the red box (B), even though the blue box (C) takes more space than that. That’s because B has a fixed height and C is overflowing it. If we add the property overflow: hidden to B, we’ll see that box A is able to accommodate B and C.
Some properties may modify this default behavior, for example, if box C is set to position absolute or fixed, it’s not considered in the computation of B’s height. Rectangle offset. To calculate the offset, processes the nodes of the tree in order. Based on the elements that were already processed, it can determine its position depending on the type of positoning and display the element has. If it’s display:block, like a div with default properties, it’s moved to the next and the left offset is based on the parent. If it’s display is set to inline, it tries to render in the same line after the last element, as long as it fits within the parent container. Some other properties besides display can also change how the position is calculated, the main ones being position and float. If position is set to absolute and the top is defined, the offset will be relative to the first ancestral of that component with position set to relative. The same works for the property left. Whenever a CSS changes happens or the DOM structure is modified, it might require a new layout. The engines try to avoid the re-layout by only processing the affected subtree, if possible. DOM Element > Render Object > Render Layer> Graphics Layer. Render layers. exist so that the elements of the page are composited in the correct order to properly display overlapping content, semi-transparent elements, etc. A render layer contains one or more render object . A render layer either has its own layer, or inherits one from its parent. A render layer with its own layer is called compositing layer. Rendering process. occurs in two phases: painting, which consists of filling the contents of a graphics layer and compositing (or drawing) which consists in combining graphics layers into a single image to display in the screen. A lot of the articles come from different sources, but a few authors seem to always been involved in them. Paul Irish and Paul Lewis are two of the folks who I’ve seen in several articles (see Additional Resources), and they have a strong presence online and might be worth following them if you’re interested in the subject.